The first thing that strikes anyone on hearing the word INDIA is diversity. The Indian industry is no exception to this. On one hand, we find companies like TVS and its subsidiaries, winning Deming’s Prize for quality whereas on the other hand, there are hundreds of manufacturing and service oriented companies which are struggling at quality levels of 30000-40000 ppm. China, which is almost as old as India has advanced leaps and bounds in the Manufacturing sector and has become the manufacturing hub of the world giving all possible ranges of quality as per the requirements. The term six sigma has been a buzzword over the last two decades in the world of manufacturing. When the whole world was struggling to achieve this six sigma quality, one Indian organization silently surpassed it thereby, setting a benchmark for six sigma itself. For those who think that technological advancement and IT are the keys to quality and efficiency, this organization makes a mockery of this assumption. The Dabbawalas of Mumbai, as they are popularly known, make Indians proud with their operational efficiency, making them the most efficient organization with the highest quality standards in the world. The word "Dabbawala" in Marathi when literally translated, means "one who carries a box". Though this profession seems to be simple, it is actually a highly specialized service in Mumbai which is over a century old and has become integral to the cultural life of the city. The Dabbawalas originated when a person named Mahadeo Havaji Bachche started the lunch delivery service with about 100 men. Nowadays, Indian businessmen are the main customers for the Dabbawalas, and the service often includes cooking as well as delivery. Everyone who works within this system is treated as an equal. Regardless of a Dabbawalas function, everyone gets paid about five to six thousand rupees per month. More than 175,000 or 200,000 lunches get moved every day by an estimated 4,500 to 5,000 Dabbawalas, all with an extremely small nominal fee and with utmost punctuality. This has been a highly specialized trade that is over a century old and now, it has become an integral part of Mumbai's culture. The Dabbawalas originated when India was under the British rule. Many Indians who worked under the British companies, disliked the food provided there and hence, a service was set up to bring lunch to their workspace straight from their home. Today, Indian businessmen are the main customers for the Dabbawalas and their services often include cooking as well as delivery. The Mumbai Dabbawalas was started in 1880 and has registered a charitable trust in 1956. The average literacy rate of its employees is 8th grade schooling. They, on an average, cover an area of 60 kms radius in a span of around 3 hours. Their error rate has been estimated recently as 1 in 16 million transactions. To achieve this standard, they use no technological backup. The cost of service collected per head is just around Rs 200 a month and this is irrespective of the distance, weight and space covered. Their turnover is approximately estimated as INR 50 Cr per annum. Their service is uninterrupted even on the days of extreme weather such as the Mumbai’s characteristic monsoons. The local Dabbawalas at the sending and the receiving end are known personally to the customers thereby, eliminating the possibility of lack of trust. All of them are well accustomed to the local area hence, allowing them to reach out to any corner in Mumbai, with ease. Occasionally, people even used to communicate between home and work by putting in messages inside the boxes. Initially, all the tiffins from a source area reach a station. There, according to the train to be loaded into, (destination area) they are separated and loaded onto the wooden crates. 10:34 A.M – 11:20 A.M: The Dabbawalas load the wooden crates filled with tiffins onto the luggage compartment in the train. Generally they choose to occupy the last compartment in the train. 11:20 A.M – 12:30 P.M: At this stage, the unloading takes place at each of the destination stations. Rearrangement takes place as per the destination area and the destination building. In certain areas where the density of customers is very high, a special crate is specially dedicated to that area. It carries almost 150 tiffins is used and driven by 3-4 Dabbawalas. 1:15 P.M – 2:00 P.M: The Dabbawalas start collecting the crates from the offices, where they have delivered an hour earlier. 2:00 P.M – 2:30 P.M: The group members meet for the segregation as per the destination suburb. 2:48 P.M – 3:30 P.M: The return journey by the train where the group meets up after a day’s routine of dispatching and collecting from various destination offices. 3:30 P.M – 4:00 P.M: This is the stage where the final sorting and dispatch takes place. The group meets up at the origin station and they finally sort out the tiffins as per the source area. This excellent operations scheduling without the use of any technology excited people like the Prince of Wales, Richard Branson, etc and they paid a visit to their nodal point at Churchgate station, to understand and observe their operation and were awestruck at their efficiency. Flexible Infrastructure: The back bone of BDO is the higher frequency of sub-urban train services. There is a train service virtually every minute. The entire operational area of the BDO is serviced by the well developed railway infrastructure. Further, the train services are inexpensively priced. Customer Co-operation: The members of the co-operative do not wait for the lunch boxes, if they are not ready when they arrive for collection at residences. The household understands the need to be punctual to support the functioning of BDO and extend appropriate co-operation. Appropriate network structure: The logistics network of the BDO is a combination of milkman route, hub-hub transfer and hub and spoke distribution. There is a perfect symmetry in the reverse logistics operation. Topography: The BDO has evolved in the concept of Mumbai city. The operation area topography is linear. At the origination it is dispersed over a large area. At the destination it is concentrated on a smaller geographical area. The traffic pattern is characterised by low volume spread over larger area to high volume spread over small area. Process Capability: The total time from collection to delivery is 3 hours. End to end (conservative) travel time is -1.30 hrs. Travel time to the nearest railway station at the origin 30 min, sorting and material handling etc. -30 min. And final dispatch -30 min. All this adds up to 3 hours. However the time available for end-end delivery is at least 4 hours. Thus the BDO process is inherently capable of meeting customer expectations and specifications. Further the delivery of the lunch boxes is consolidated at the floor level at the consumer location. In a place like Mumbai, this saves significant time, energy and possible complications. The customers also participate in the last step of the (lunch box) delivery process. Further, it makes no difference to the customer (on time dimension) as long as the delivery is made before 1300 hrs. Redundancy: Each route (collection) is assigned to an individual member. Often, this information on collection route is known to every other member. Should there be a need to substitute a member on the collection route, it can be done effortlessly, without affecting the collection process and its accuracy. Coordination: The responsibility to collect, transport and deliver lunch boxes is at the individual member level. There are no managers or supervisors in the system. Every member is motivated, trained, disciplined and empowered to do his job to the best of his ability. Structure: The structure is decentralised. The model is scalable (on volume). It is a three tier structure, (see adjacent figure) co-operative organization. The basic units are individuals, teams and groups. There are in all 120 business units. The president, Vice President, Gen Secretary, Treasurers, Directors; all come under the top tier. Compensation: Compensation in a group is same to every member irrespective of work load and responsibility. Transportation Economics: BDO is an example of judicious mix of transportation economics. At the collection it is a milk man route structure to handle scattered collection centres and this is supported by a hub-hub transfer to handle large volume at reduced operational cost. At the destination, it is hub to spoke to ensure response time and handle large volumes. The rail infrastructure ensures flexibility and lower cost of operations. Flexible man power deployment and codification system guarantee appropriate response time, smooth flow of information and material tracking system. Recently, the Dabbawalas started embracing technology via implementing “Order through sms” initiative. The customers can book for their delivery through sms and the Dabbawalas would do it for them. A website www.mydabbawala.com has also been added to allow for booking through online means. An online poll also has been enabled to ensure customer feedback. The success of the system depends on teamwork and time management that would be the envy of a modern manager. Such is the dedication and commitment of the barely literate, bare footed delivery boys who form links in the exclusive delivery chain, that there is no system of documentation at all. 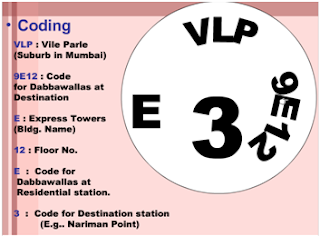 A simple color coding system doubles as an ID system for the destination and the recipient. There are also no elaborate layers of management, just three layers. All that the Dabbawala contributes is a minimum capital in kind, which includes two bicycles, a wooden crate for the tiffins, white cotton kurta pajamas, and a white Gandhiji topi. The return on their capital is ensured by division of the monthly earnings of each unit. Some feathers in their cap include a world record in Best Time Management, a name in the Guinness book of World Records. They are officially registered and have been exclusively featured in the famous show “Ripley’s Believe it or not”. Apart from these, they are also invited by organizations like CII, for lectures and honorary positions in national level conferences. Thus, with honesty and organizational values riding the reins of operations, the Dabbawalas made their name embossed in the history of World Operations. It is a matter of great pride for India to be the homeland of such organizations. It is now, time for the other organizations to improve their operations to match these kind of elite standards thereby, enabling India to serve as a beacon light in the field of quality.